A hilarious JRPG romp with far more than laughs on its side. What is it? A JRPG-style adventure into comedy and genocide; first one, then the other. A classic game style packed with new ideas. Undertale shouldn’t be spoiled in advance. You’ve seen the score, you’ve seen from the screenshots that it’s a JRPG-style game, and I’ll tell you up front, it’s one of the funniest and best designed RPGs you’re likely to play this year. Beyond that, I’ll try to stay light on details—as much as I can while still telling you why it’s great—but avoid Google, avoid forums, avoid picking away at the scab of not knowing much. The less you know about Undertale before diving in, the better it can work its magic. The basic secret is that it’s not entirely what it looks like: a goofy 8-bit RPG parody that owes a debt and at least two limbs to EarthBound/Mother. It’s partly that, sure, and it’s brilliant at it. After a slow and not particularly fun intro area, it opens up into a world more densely packed with jokes and puns and adorable characters than pretty much anything out there. Papyrus, the skeleton guard desperate for recognition and friends. His brother Sans, mocking RPG puzzles by just dumping a Junior Jumble to block your way. Crazy monsters like Woshua, who just wants you to be clean, and a ghost who only lowers his HP when you attack to be polite. I haven’t laughed this hard at a game in years, and if Undertale was purely a joke RPG like Cthulhu Saves The World or Barkley Shut Up And Jam: Gaiden, it’d honestly be enough. Even its weaker moments where it veers too close to reference and inside joke oversaturation—the stuff of many a comedy RPG Maker game—just about work, if only because they’re always over quickly. But that’s just what’s happening on the surface, and it’s disarming in just the right way. The cleverness builds as you play, and systems that originally seemed throw-away usually end up being more than they seem. The big gimmick is that nobody has to die: there are ways to spare everything and everybody, from the random monster encounters to the bosses. Combat plays out via a series of minigames, mostly unique to each monster, in which you move your pixel heart around in a small box—dodging bullets, blocking shots with shields, simple platforming, getting past shields, often layered to make things more complicated when you face off against multiple enemies at once. As a really basic example of the mechanics being more than they seem, Undertale often uses them to convey the character’s mental state: faster attacks when they’re annoyed, bolder attacks when they’re feeling confident, or even aiming to miss when they don’t really want to fight. There’s the vegetable who just wants you to eat your greens and will leave you alone if you do. A late game encounter with a character who gets a mid-battle telegram from a previous zone to tell them that it’s cool, you’re a friend. Papyrus, who's so desperate to have cool attacks that he’s forgotten to actually make them deadly, and who's interrupted by a dog stealing the bones he intended to throw at you in his next turn. How you choose to handle things affects how the story plays out. 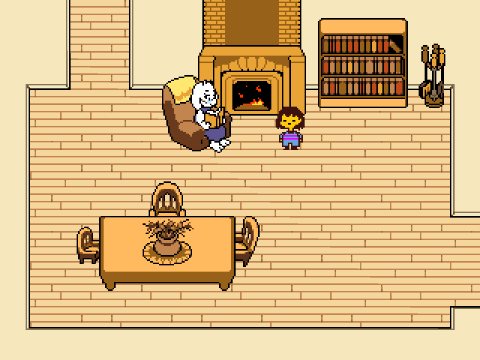 It also affects your replays, with Undertale interested in experimenting with what happens if certain characters remembered what you did the last time, and what the implication of that power might be. Finishing the story only takes about 5-7 hours, but to dig into its secrets takes another couple of loops, and a strong stomach. We’re also not just talking a few line changes. Going for a genocide run, where you murder literally everybody, essentially turns the whole thing into a pitch-black horror game. A peaceful run meanwhile leads to one of the most charming and heartfelt RPGs ever made. Murder followed by a reload to see what might have been… well, you get what you deserve. You can spare the monsters. Not always their feelings. Undertale obviously has its faults, including a couple of puzzles that wear out their welcome, a first play that’s a little too easy to be satisfying, and occasionally relying a bit too much on players getting jokes like a jealous aircraft called the ‘Tsunderplane’. If you can’t stand those, or the JRPG style in general, it won’t likely win you over. Every player also seems to have one area that they dislike, though rarely the same one—for me it was the Hotlands, not because the action was bad, but because the puzzles were time consuming without being satisfying. Luckily, the same location also had one of my favourite characters, as well as one of Undertale’s best direct parodies. To miss it though is to miss out. Undertale isn’t simply like Earthbound, like Chrono Trigger, like Final Fantasy VI in its graphical and mechanical style, but a worthy successor to the way they took the JRPG genre and experimented with it, evolved it, took it in new and interesting directions. It’s an old-school game, but one designed with modern sensibilities and an eye for deconstruction matched only by Knights Of The Old Republic 2’s brutal assault on the Star Wars universe. The fact that this is basically a one-person project only makes it more impressive, from the excellent use of simple graphics to convey emotion, to the fantastic lo-fi soundtrack. It may or may not be the best RPG you play this year, but it’s certainly going to be one of the most worthwhile—as memorable as anything in, say, The Witcher 3, and every bit as worthy.